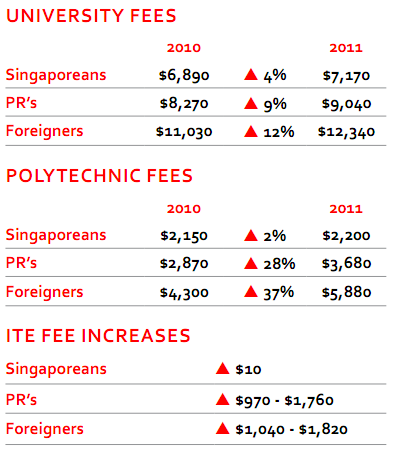 There’s a recent news update that our Tertiary Education in Singapore is going to cost more. And the fee hike is applicable to this year’s cohort. Ouch! So for those parents who are working hard to send their little ones in 10, 15 and 20 years time, what’s the financial impact should the fees of Tertiary Education to increase on an annual basis? *For illustration purpose, I will be using the increment as 4% on the current annual fee of $7,170. Also assuming that the duration to get a degree is 3 years. Therefore, the total fee that we are looking at is $21,510. This amount is not inclusive of living expenses. And if you are concerned in planning for your little ones, here are a few common alternatives that you may consider in helping you to do so. There are also a few considerations that you may wish to take note. If your little ones have a certain level of talent when they are young, do help to them to cultivate on the talent as young as possible. But… do not force them too hard! Let them appreciate their childhood as well. There are many scholarships available. So once they are ready for it, do apply for them and if they are successful, the benefits can be two-fold, 1) Full Sponsorship of their University Education, 2) A Guaranteed Career once they have graduated. There are also the usual terms and conditions attached to any scholarships, so do go through them carefully. As you can see from the above, the amount required to save per month reduces given that the time frame is longer. What you can learn from here is that, you need to plan early and be committed to it. If you plan slightly later, you will have a higher commitment in terms of savings, leaving you lesser for other stuffs. An Endowment Plan is basically a Regular Savings Plan under an Insurance Company. Under such a plan, your little ones and you will be provided with some form of insurance coverage like Death and Permanent Disability Benefits on the little one and a waiver of future premiums coverage on the applicant. As compared to Option #2, you will notice that your regular contribution is lesser now because you are forgoing the flexibility of stopping or withdrawing the plan early in exchange for a higher return. You will also be getting an additional benefit – insurance coverage to protect against any unforeseen circumstances. A Unit Trust Fund is usually a collection of stocks of some companies or indexes that is managed by a Fund Manager. Nature of such savings tool is that there’s no guarantee at the end of day, and really dependent on economic conditions, the nature of the Fund and the investment strategist of the Fund Manager. Once-a-while monitoring would be required to ensure that you are always on the right track. Similarly, you would need a lower contribution amount for a savings tool that gives a higher return in exchange of risk and the requirement to monitor. the need to plan for other education – primary, secondary, junior college or polytechnic?